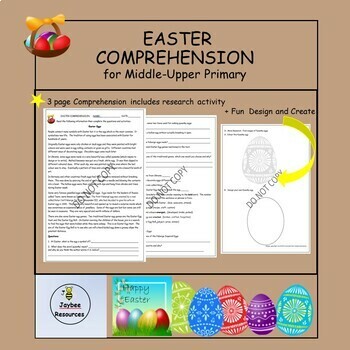 Ready to print comprehension and activity sheet about Easter eggs with no religious content. Children can gain meaning from text, explain information, give opinions, complete vocabulary and True/False questions, undertake research activities and design and create. Includes answers. Differentiation: More capable students can complete unassisted or in pairs. Low level readers can work with teacher or teacher aide. It is suggested these children number the paragraphs and use highlighters to locate answers. This activity was successful in engaging all students as it offered something for all learning types.